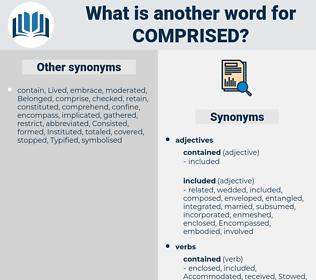 What is another word for Comprised? Comprising, comprises, incorporated, formed, includes. Consisted, encompass, Encompassed, Containing, covered, involved, completed, contained, split, appreciated, reconciled, Embraced, featured, compounded, accumulated, divided, listed, understood, Had, Accounted, Ranged, Chaired, realized, Dealt, called, Dialed, Dialled, manned, Numbered, formed. Consisted, Corresponded, Compromised, risen, Encompassed, posed, represented, enclosed, composited, covered, combined, representative, Compiled, organised, Contributed, involved, increased, possessed, occupied, concerned, consolidated, Compared, mainstreamed, commissioned, misunderstood, disclosed, comprehended, Performed, contained, split, reflected, concentrated, depicted, reported, specified, Mattered, embodied, presented, codenamed, mobilised, chosen, collected, employed, Inserted, Constructed, emphasized, guaranteed, recorded, Accommodated, realised, raised, categorized, Construed, implemented, Symbolized, envisioned, measured, Borne, perceived, selected, Disbursed, Convened, Entailed, governed, configured, implied, Provided, Issued, predicted, Jeopardized, Replicated, Administered, derived, produced, ascertained, Shown, Resulted, copied, assembled, monitored, structured, acquired, Appeared, appreciated, integrated, Offered, gathered, dominated, associated, Served, Submitted, interpreted, Remitted, Introduced, Housed, infected, become, merged, Mentioned, Embraced, insured, Confronted, Referred, Created, instructed, i.e., illustrated, Attributed, subsumed, designated, Contemplated, opened, Generated, Rendered, mixed, projected, grouped, populated, Operated, foreseen, Investigated, separated, Amongst, member, recognized, Relied, expected, documented, Aimed, accomplished, reproduced, addressed, forecast, anticipated, shared, directed, underlain, Invoked, ensured, serviced, extended, analysed, enrolled, Deemed, Counted, signified, developed, amassed, equipped, Reached, registered, Cited, portrayed, allocated, accrued, Screened, classified, started, Brought, fragmented, featured, compounded, accumulated, conducted, groomed, Enshrined, Managed, nominated, prepared, Been, shaped, spent, sworn, related, Begun, pointed, arranged, Inaugurated, mistaken, appointed, initiated, divided, listed, secured, expanded, undermined, Mobilized, Duplicated, entrenched, varied, earned, Captured, understood, maintained, identified, Evolved, reassured, Aggregated, Poured, Discussed, placed, Targeted, focused, focussed, furnished, verified, stored, Filed, grasped, laid, budgeted, educated, proved, proven, Instituted, Denominated, schooled, Emerged, Annexed, Examined, seen, renamed, Equated, sought, have, assured, satisfied, worn, inscribed, faced, Entered, written, trimmed, embedded, struck, Had, crewed, effected, desired, qualified, Accounted, hosted, matched, Ranged, keyed, Installed, mandated, titled, evaluated, reunited, Carried, situated, intended, Viewed, Afforded, virus, Demanded, fulfilled, taught, handled, forged, evidenced, framed, suited, marked, Drafted, Looked, chartered, built, attended, designed, drawn, entitled, centred, Meant, played, cloned, Regarded, Shipped, Obtained, known, defined, woven, turned, Undertaken, delegate, Channelled, elected, planned, attempted, driven, Judged, Flown, won, Launched, realized, learned, Learnt, Amounted, Lodged, Pooled, based, Dealt, graduated, kept, staffed, stated, granted, found, bounded, Passed, called, Dubbed, figured, located, Dialed, Dialled, read, headed, funded, party, Bundled, manned, paid, put, taken, door, Acted, founded, gone, run, Numbered, made, done, Gotten, shed, named, composition, incorporated, formed, includes. 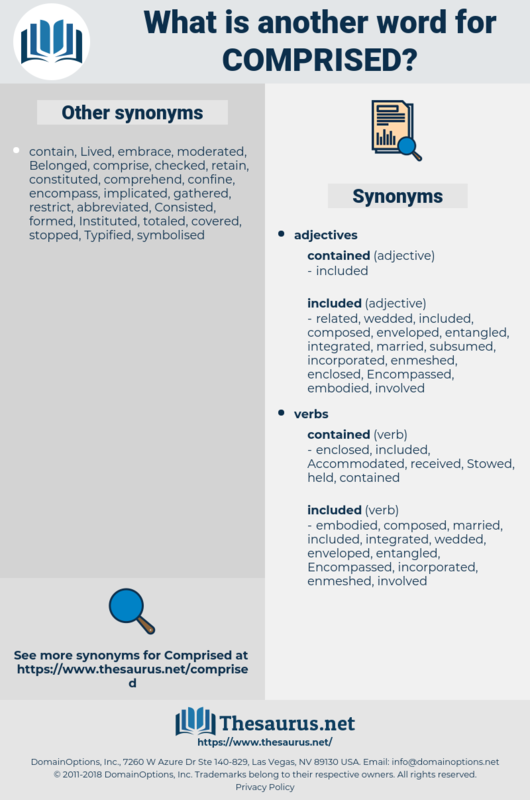 constitutes, encompasses, encompass, incorporate, covers, involves, comprehends, embodies, realises, entails, boasts, Entailed, Houses, embraces, expects, extends, sympathizes, spans, features, ranges, intends, realizes, asks, finds, counts, entail, embrace, includes.
" They may all," he says, " be comprised in self - trust." A large house, a doll as big as herself, and a tender face bending above her, comprised her store of reminiscences.